A men's hairdressing specialist, and a whizz with a cut-throat razor if you like a traditional shave. Apart from great haircuts and shaves, Marshall loves to talk footy. Amelia brings a new level to service and creativity. Trained with l'Oreal Professionnel and has worked backstage at many high profile events like London Fashion week. Ian 'Scissorhands' Smith is a colour specialist and enjoys creating new and exciting looks for his clients. 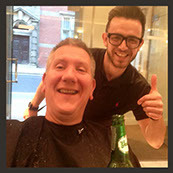 An experienced hairdresser in all aspects and loves to coach junior team members. Specialising in colouring, cutting and extensions. Georgia loves hairdresssing and brings her fab skills and personality to Team FM. Mckenzie is learning quickly and is developing her skills on the salon floor. Always a smile and a nice welcome.